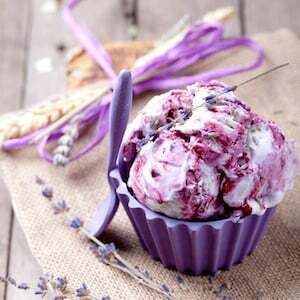 Lavender ice cream is a gourmet flavor you can make with fresh or dried flowers. This recipe calls for fresh lavender; dried lavender is more potent. Lavender brings a sophisticated, floral flavor to this homemade ice cream. Wash the lavender and shake dry. In a pot heat the cream and lavender sprigs. Add the powdered sugar and stir until fully dissolved. Strain the liquid mixture and pour into a bowl. In a medium-sized bowl, beat the egg yolks until foamy. Bit by bit stir in the lavender mixture. Pour this new combination into a pot on low heat. Constantly stir until a creamy texture occurs. Allow to cool and pour into a flat freezer-safe dish. Place the ice cream into the freezer for about 4-5 hours. Stir every 30 minutes to allow the mixture to evenly freeze. Garnish with lavender sprigs when serving.